Garages that are attached to your house can save you the trouble of going back and forward to a remote self-storage space every time you want to search through your old records, the office papers and the old family pictures. Garages host your car, your bicycles and a million more useful and useless beloved things that you keep gathering since your childhood. This is where you do your laundry, repair an old chair, exercise or just sit and enjoy your kids play in the front yard. Garage doors are a blessing because they keep your fascinating little private world hidden from the strange eyes and protected from the bad weather. You just feel safe and confident when you press that button and the door closes down promising to keep you and your private belongings secure and safe. Sometimes, we forget that garage doors are just mechanical friends, which need special attention and regular maintenance to endure the continuous operation and the fluctuations of the weather. One day we press the magic button and the door doesn’t move. It could be anything! You may need to change the batteries of the remote or the cable may have loosened up, the opener may have been broken or the springs may have been damaged. Garage doors break down and wear out in time and under normal circumstances all parts must function perfectly. Yet, some parts are even more important for the excellent performance of the door. Our company specializes on garage door springs because they are considered their heart and soul. We have experience with springs installation, replacement and repairs, but we can also fix any other garage door damage. 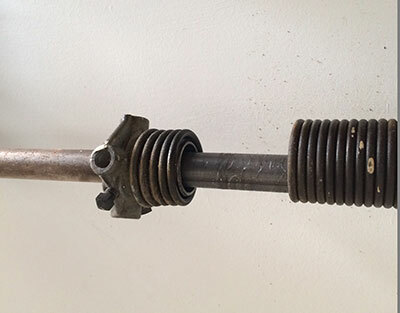 Extension springs, which are meant for light weight doors, are placed on the two corners in the upper level of the door whereas the torsion springs, which are proper for heavy doors, are installed in the middle upper center. Springs have the important mission of lifting the heavy load of the door and, hence, must always be in excellent condition. Nowadays, you can also choose galvanized springs that are even stronger and they have a fabulous look. The most important thing you should remember about springs is that they can be very dangerous. If you have broken springs and cannot operate your door, don’t try to fix them yourself because you are in a hurry to get your car out of the garage. Garage Door Springs Tustin will be your best option, if you want the job done quickly and efficiently. We have an excellent emergency phone line 24/7 and we, also, have the appropriate equipment to complete the job fast and properly. Do you know that attempting to repair or replace the springs alone can cause you injuries? Springs are heavy and have high tension; therefore, they can easily snap and hurt you badly. Garage Doors Springs Tustin will repair and replace the broken springs at any time. Yet, you could always schedule appointments for preventative checkups just to be on the safe side.